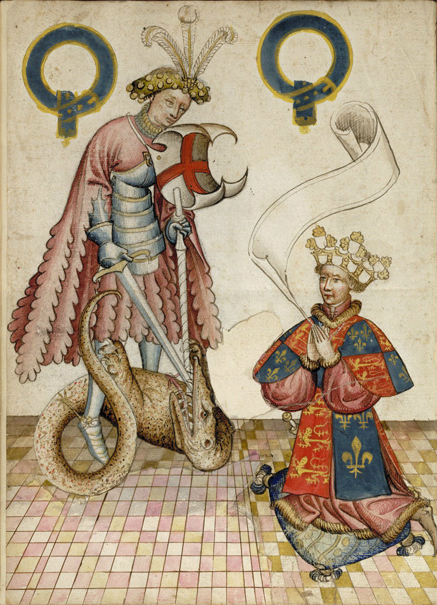 The garter king kneels before St George in London, British Library, Garter Book, 1435. The Order of the Garter was founded in 1348 by Edward III and twenty-five noblemen. Containing full-length portraits of the founders and St George, the Order’s patron saint, this armorial book was probably commissioned by William Bruges, to commemorate the restoration of armorial decoration in St George’s Chapel, Windsor, begun 1421. The portraits are formulaic with slight variations in costume–mainly headgear. Each founder wears armour and the blue mantel with Garter arms on the left shoulder and surcoats decorated with their arms. A large scroll across the top of the page identifies the figure, who stands with a panel with his family arms as appear on the stalls in St George’s Chapel. One of its pages has a later inscription identifying the pictures in it were the designs for stained glass windows in St George’s church, Stamford, but scholars now question this tradition. Bruges lived in London, where the pictures were probably made.